The quesadillas are a very simple recipe of the Mexican cuisine since they only consist of tortillas folded in half, to which melted cheese is put in the middle. But the best about the quesadillas is that they allow numerous variations, that make that no one gets tired of them. In this recipe potato is added to the quesadillas that combines very well with the cheese and with the maize of the tortillas – these quesadillas are very nutritious and very filling. These quesadillas can be served as appetizer or you can prepare a spectacular dish of red rice with fried plantains , refried beans and logically these quesadillas. This recipe is super easy, only a type of potato puree has to be made and then the quesadillas are made. To make the quesadillas a cheese that melts has to be used. We recommend the Oaxaca cheese, Chihuahua cheese, Monterey Jack cheese, etc. Would you like to prepare the quesadillas with homemade corn tortillas? The preparation time of these quesadillas is of 30 minutes . Bring the saucepan water to a boil over high heat and leave the potatoes cooking in the boiling water for about 20 minutes, until they soften. To know if the potatoes are ready, spear the potatoes with a fork. When you feel that the fork goes in and out smoothly the potatoes are ready. Transfer from the saucepan to a colander the potatoes that were cooked and rinse them with cold water. Peel the potatoes that were rinsed and put them in a bowl. Mash the potatoes that were put in the bowl with a potato masher, until having the consistency of a puree; then set aside. Some of the Potato Puree that was prepared. Fold in half all the tortillas that were put in the griddle. Heat the potato quesadillas for approximately 1½ minutes per each side, until the cheese has melted. While the quesadillas are heated they can be pressed gently so the potato unites with the cheese and they will heat faster. Recommendation: You have no idea of how tasty are these quesadillas with some pickled chilies. 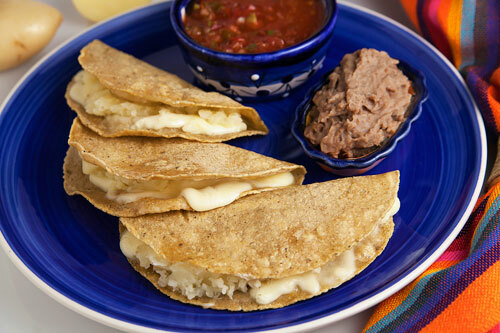 Variation: Taste these quesadillas with another flavor... with blue tortillas. Did you like the Potato Quesadillas? Use a good potato masher for this recipe, so the potatoes have the consistency that you want. This Oaxaca cheese has a soft and creamy flavor... perfect for your quesadillas. Start cutting like the pros with this “Set of Victorinox Knives". These knives are comfortable, they have a good balance, they are sharp and you can sharp them as many times as you want.